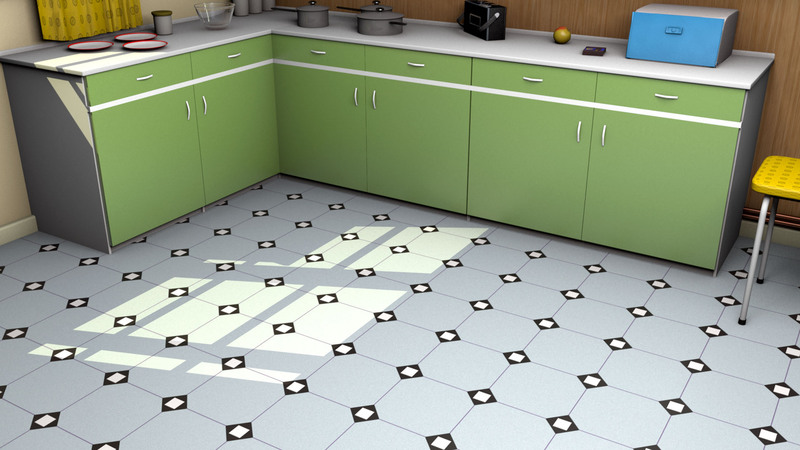 Vinyl flooring in kitchens is a good choice since it is easy to keep clean, quite inexpensive to purchase and easy to install. Most of all, of course, it can also be very decorative. This pattern was intended from the outset to be flooring for a kitchen and it is shown here using my mid-century kitchen set. The colours are simple ones, a background of silver with montella for the motif. Lino or vinyl floor patterning was very popular mid-century and the choice of patterns ranged from quite outrageous to very mundane. This pattern is a simple easy-on-the-eye design that is intended not to catch the eye but to make the floor of the kitchen recede away thus enhancing the dimensions of the room. 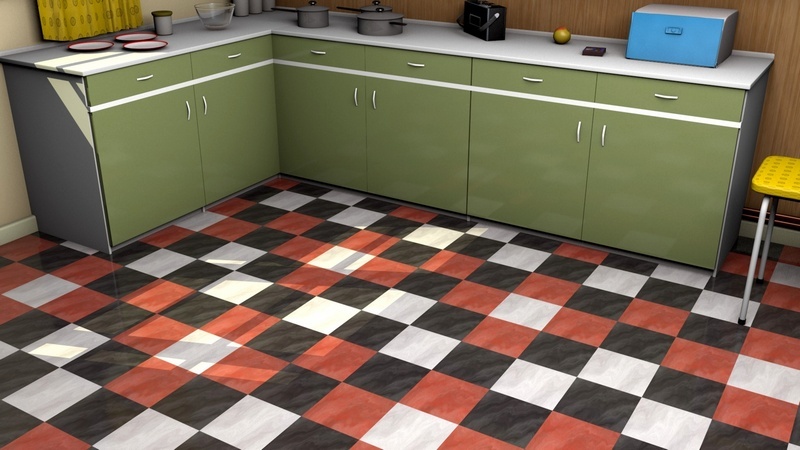 The design was created with Xara Designer while the set is my normal mid-century kitchen set created in Cinema 4D. The 1960s, and the decade that preceded it, saw an increasing use of linoleum – lino – or vinyl as a useful floor-covering. This design is intended to look good and to be easy to clean and, in particular, to give the kitchen a sharp and genuine mid-century look. The design itself is a simple one made with Adobe Illustrator while the set is my mid-century kitchen set created with Cinema 4D which was also used to produce the image. I tried various colour schemes, which worked fine and with success, although the green works well with the existing units to save me re-colouring them. Regular readers of this blog will know that we have a particular interest here at 20th century 3D in lino and vinyl floor coverings. Although I refer to the floor coverings by the term lino I also mean vinyl floor coverings which I appreciate is a different process. The pattern is based on a standard pattern which has been in use throughout the mid-century period and can probably still be bought today. The colours used are typical mid-century colours which you would have found in a kitchen although, perhaps, the red colour could also have been a little bolder. 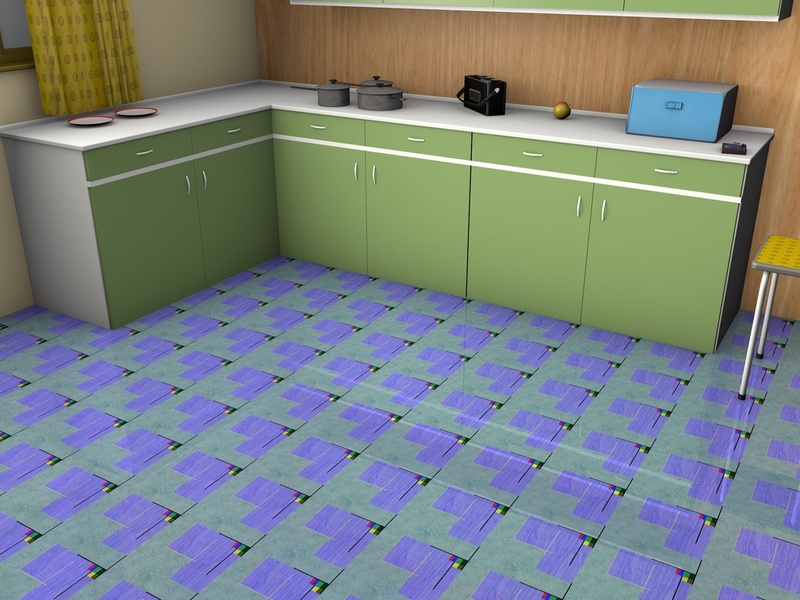 A floorcovering like this is both practical and useful since the design enhances the size and dimensions of the room. I have quickly repainted the units to blend a little better with the floorcovering but other than that no changes have been made so it is possible to compare this with previous posts using this kitchen set. I also remember seeing, now that I have the opportunity to look at the final render, a similar floorcovering where the red was replaced with a brighter yellow colour and this is a pattern variation that I may well try. In the early years of the 1950s this sort of linoleum was a popular choice for the floors of the kitchen and perhaps the bathroom in houses in the UK. There are the usual black, white and red colours represented here as you would expect for the 50s, albeit in small measures, but still very visible. Also this lino is slightly more shiny and now looks a little more realistic. The pattern was created in Xara Designer using swatches made in Filter Forge as I explained previously and the scene rendered using my kitchen set in Cinema 4D.